Hillforts are one of the most prominent types of prehistoric monument seen across many parts of Britain and Ireland, and this hillfort project has recently been set up with the aim of producing a paper atlas and an online searchable atlas linked to Google Earth. It is a collaborative four year project between the Universities of Oxford and Edinburgh, and contributions from members of the public, either as individuals or as part of local field groups, are welcome. Several members of NOSAS were interested in this project and a field day took place in May which nine attended. We visited three forts in the Drumnadrochit area which James McComas had suggested. The day was a great success even though the weather didn’t exactly co-operate and the overall impression was “damp” to say the least! 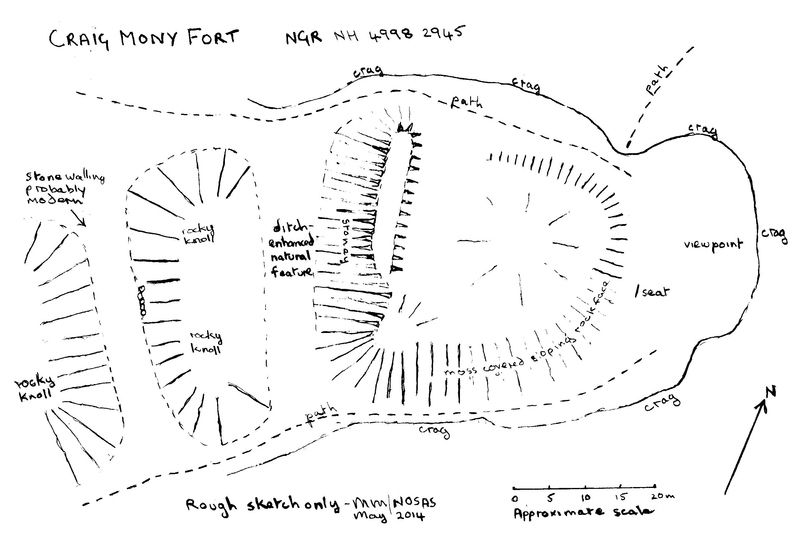 The three forts of Dun Scriben, Craig Mony (Craigmonie) and An Torr were very different from each other – we took photos, made rough sketches and filled in the (reputedly) tortuous form provided on the website. The form proved to be not as formidable as we had anticipated and has been submitted to Strat Halliday who is the Scottish and Irish end of the project. If any members are interested in participating in the project or in joining the next NOSAS field day please contact Meryl Marshall. 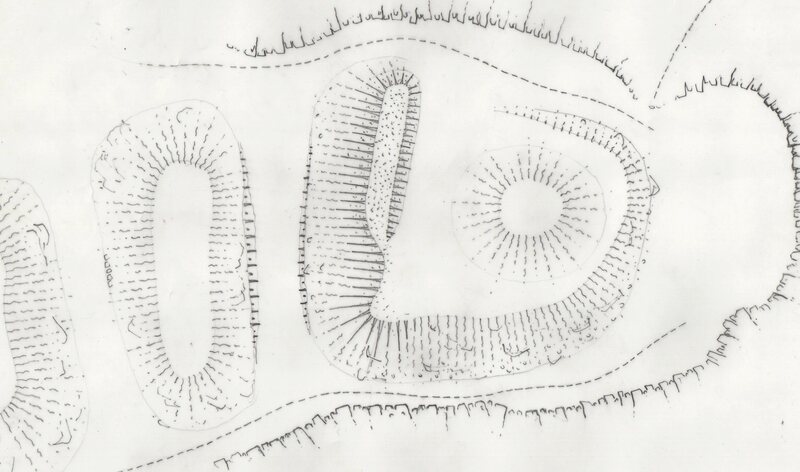 A drawing or sketch of a site, even if it is not precisely to scale, gives so much more information than a written description. Ideally it would be good to produce a plane-table drawing but this is not always a convenient method as it is time consuming and involves carrying heavy equipment to remote and inaccessible places. So when doing the recent surveys at Drumnadrochit we experimented with several methods of survey: using tape and offset, pacing and GPS waymarks. A draft sketch on permatrace was produced but, as usual, it was a bit messy – the words “dog’s breakfast” came to mind! A tidy final drawing was needed, so using a further piece of permatrace and a 4H pencil, I traced the site using hachuring as per RCAHMS guidelines, with annotations to clarify some of the features; I then scanned the result, see sketch of Craig Mony Fort. For me this method of drawing up is new and I have not perfected the technique yet, but Ian Parker of RCAHMS was helpful in giving advice and suggestions, and also his own drawing below. For the last century or so the battle was thought to have taken place at Dunnichen in Forfar-shire but Alex Woolf in his paper argues very convincingly for it to have been fought in the North. Dunachton in Strathspey fits the bill admirably and, if it was Pictish, Tor Alvie Fort must surely have played a significant part! 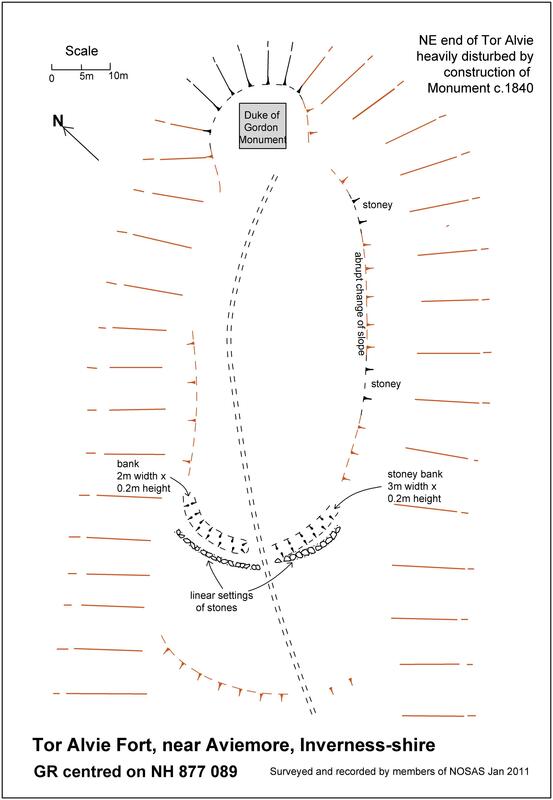 This entry was posted in Badenoch and Strathspey, General Archaeology, Iron Age, Loch Ness, Aird and Inverness, Pictish, Surveying and Recording and tagged Alex Woolf, alloy broach, An Torr, archaeology, archaeology Scotland, atlas of hillforts in britain and ireland, Aviemore, Craig Mony, Craigmonie, drawing hillforts, Drumnadrochit, dun, Dun Nechtain, Dun Scriben, Dunachton, GPS waymarks, hill forts, hillforts, iron age archaeology, Iron Age Dun, Meryl Marshall, North of Scotland Archaeological Society, NOSAS, Pictish, picts, plane table, planetable, RCAHMS, recording and surveying, Scottish archaeology, Strat Halliday, tape and offset, Tor Alvie on September 15, 2014 by nosas.